I met Thin in a café on Le Thai To Street in the south of the Old Quarter. I was studying a street map, working out where I was, tracing where I’d been since leaving my hotel. It was a December Saturday afternoon in Hanoi, overcast and humid, looking like rain. “Have you seen the turtle?” he asked. “Not yet,” I said. I’d heard that one of Hanoi’s lakes harboured its own giant turtle but hadn’t discovered which; lake or turtle. He was in his late thirties wearing a blue open-necked shirt and camel-coloured chinos. On the table in front of him was a glass of sweet Vietnamese coffee sitting in a bowl of hot water. He jerked a thumb over his right shoulder. “It’s over there,” he said. “Hoan Kiem Lake. It means ‘Lake of the Returned Sword.’ The turtle suns itself on the island in the middle. When it’s not underwater,” he grinned. He was a tour guide, visiting Hanoi from his home town of Hué to pick up a group arriving from Italy. He told me what I assumed to be the standard turtle story for visitors; the borrowing of a magic sword from a dragon king by a nationalist hero, the driving of the invading Chinese out of the country by said hero, and the return of the sword by said hero to the turtle god who lived in the lake. 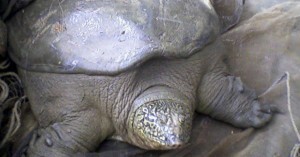 The incumbent turtle was a symbol of Vietnamese independence and longevity. The Vietnamese obviously didn’t like the Chinese. Later, I walked around the lake, scanning the murky waters in the hope of spotting the turtle. It started to rain. I paused opposite the turtle-sunning island which Thin had told me about. A three-storey stone pagoda stood in the middle of it. There was no sign of the turtle. Sunday morning was clear and sunny. I guessed it was going to get hot and decided to make an early start on exploring the city. My map showed more lakes to the north-west of the Old Quarter. 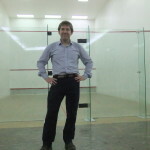 On the the north shore of one of them stood The Hanoi Club, home to what I guessed were the only squash courts in Hanoi. I set out, sticking to the shade, avoiding stepping into the incessant motor-cycle dominated traffic which swarmed through the streets. I reached Truc Bach Lake and walked along its shore in an anti-clockwise direction. It was much quieter here than in the heart of the Old Quarter, and I felt more relaxed as I strolled underneath the trees, weaving my way around the parked motor-cycles. The concrete, glass and steel fascia of The Hanoi Club housed a five-star hotel, high-end residences, restaurants and a sports club. Uniformed staff opened the door to the hotel lobby, served me in the coffee shop and directed me to the sports club’s reception area. Mai took me to see the squash courts, two floors up and, disappointingly, unoccupied. Two glass-backed courts stood back-to-back separated by a snooker table. “They are the only squash courts in Hanoi,” she said proudly. She didn’t seem to know much about their use but pointed to a dark wooden board on the wall. The board included a series of parallel slots holding white cards bearing the names and telephone numbers of players. It was the Club’s squash ladder. 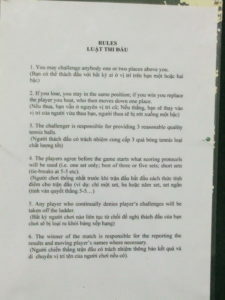 The rules, in English and Vietnamese, were displayed beside it. Thanks to the Global Post for its article on the death of the sacred turtle. Details of The Hanoi Club can be found here.